What do you do when you’re surrounded by gorbies and the glacier you’re standing on is melting below you? 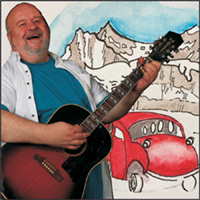 In the summer of 1979, Vancouver-based storyteller Jim Sands worked as a Snowmobile Tour Guide on Jasper’s Athabasca Glacier. He fended off gorbies (slang for pesky tourists) and experienced adventures that influenced the rest of his life. Ironically (or coincidentally) this was the second of two shows I had seen the same day about an experience out west. Jim Sands transports us back to the 70s, where he proceeds to regale us with the exciting life of a snowmobile driver on the glaciers in BC. Sands is descriptive, engaging and wove his words to paint such a picture in our minds that it could have felt that we were there as well. He strums his guitar as he sings about life in the mountains, the danger of nature, and how sometimes opportunities for greatness are in the least likely spot. British Columbia is a very difficult place to describe; the beauty of nature is nearly beyond words and traveling to and chasing down dreams in places like this is where it’s at! Sands’ experiences are entertaining, heart warming, very funny and unexpected. It truly is a feel good play. Make sure to check it out and get your handshake from the charming man himself on your way onto new exciting places.